So how'd I do keeping to my goals in 2017? Not great, not terrible, but not great. -I did manage to get some more PVM Gear and I did start doing Reaper tasks at least but my gear isn't really near where I want it to be yet and I pretty much don't keep up on Reaper tasks. So I still need to work on that. -I did get all of my ports skills to level 90; in fact, all of my non-elite skills are at least level 90. -I expected to have at least one of these to 99 by now (slayer) but to be fair I have made general progress with them so I'm not too upset. 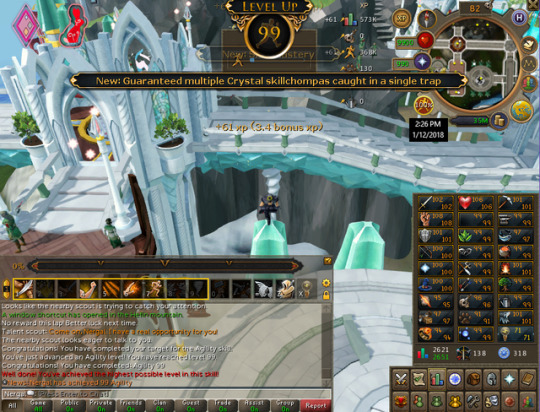 -8 skills left to 99 for Max Cape; 6 of them are over the halfway point. Got Smithing, Fletching, Crafting, Divination, Thieving and Farming all to 99 this past year. (Technically I got Summoning, Woodcutting and Cooking 99 this year as well also but they were covered in the March 2016 to March 2017 OG NergalElite progress Thread). -Did barely any questing this year. Got my name changed from NergalElite to Nergal. Did a decent amount of flipping items over the summer and saved up enough to buy myself a Nox Staff. Got a couple of scrolls from player owned ports, most notably the Vamp Scrimshaw and Rocktail Soup working towards the armor but because of how infrequent my logins over the year were I didn't get nearly as many ports resources as I should have. Added Ganodermic creatures to my preferred slayer tasks. Unlocked the Tuska's Wrath ability (awesome for slayer). I stopped doing Arc daily tasks but now that I have 90 Hunter I have a reason to return. Going to add my goals for 2018 in the next post of the thread. PVM Gear (Again, I really want to get into some more bossing.) Gotta perk out some gear. I want a boss pet this year, don't care which. Starting the New Year by getting level 91 Hunter. 55 Levels till Max Cape. 52.7 Million experience to gain across 8 skills for my max cape. I could max this year just by gaining a little over a million xp per week, again this feels doable. Construction and Invention are my last buy-able skills (unless you choose to include agility because silverhawk feathers). With all of the other expensive skills already out of the way, I feel free to take my time with construction and focus my immediate funds into equipment improvements. Between Warbands, Statues, Daily Challenges and XP rewards I should be able to save a decent amount while leveling Construction with a bit of patience. Obviously I plan to do a decent amount of construction wit all the Protean Planks I have stockpiled whenever DXP rolls around again, but construction, being as absolutely useless as it is, is my lowest priority skill. Fishing is the closest skill I have to 99 presently but I hate training fishing so I probably won't just grind it out. Agility is close behind fishing, I'm more inclined to just grind this out than I am with fishing, but still not really about that. Construction next closest, and I've already discussed thoroughly. Slayer is 4th closest, most likely to be the thing I spend time training. Runecrafting follows at 5th closest, I pretty much only train when I have a daily challenge at this point. Not in a huge rush, need Runespan esteem though for comp cape reasons. Dungeoneering I train exclusively when I have a daily challenge, though I really should start doing sinkholes. Hunter I should probably start training at the Arc and/or do hunter related diary tasks and comp requirements. And last but not least, Invention. I plan on doing invention coupled with Slayer & Fishing as well as while trying to unlock the Reaper title. So yeah, those are the skills that I have left to train and my current stances on them. Not quite done with the first week of the new year but I'm currently 50,977,766 exp away from Max Cape. Went from needing a little over 1m exp in non-maxed skills per week to a little under a million xp needed, feels good to be ahead of the curve. 49.9m exp away from Max Cape 1 day into week 2 of the New Year. Definitely ahead of my 1m EXP per week goal for now. Got the last piece of the Nimble Outfit today, 6% bonus agility exp with full set worn. Wish I had finished it before I was level 98 Agility already but I cannot really complain too much, just nice to have it. I mean, it should still save me a whole 33 laps on the Hefin Course. Around 5 hours (give or take) of agility training left until I'm Level 99, assuming I don't use any lamps or stars I get between now and that point. I should probably drain my Silverhawk Boots if they have any charge left; might have a couple training dummies as well, those could cut the time significantly. I've gained 1.57 million Agility exp so far this month. 0.52 million exp until level 99. I'm not even sure if I want to rush it.... probably, I'm getting much closer to being able to manipulate daily challenges for free, once I can do that I can start doing Dungeoneering challenge everyday and get like 100k exp in 20 mins of playtime. 7 applicable for daily challenges (since invention is not). Made my DXP weekend stock investments, pretty much all of my funds are locked up in stocks now, oh well, the profit is expected to be good. I just need to not need the 100m I invested for the next month and a week or so. 99 Agility for the win. Made myself a Polypore Staff, need base parts to create the augmentor for it. Used up the last of my Monkey Trinkets from a few years ago that were cluttering my bank. On a whim, I decided to work on the Achievement Diaries. The last 2 medium tasks I have for the Varrock set are taking a hot air ballon out and getting a cat training medal. I've heard the odds of catching a rat improve once your kitten grows into a cat, but as a kitten I already have 25/100 rats I need. This task is so boring, a lot of work for a 5k exp lamp. I can now confirm that, I spent most of the time my kitten was growing into a cat, a few hours, trying to catch mice and got like 50 of the mice; once it was grown I got the remaining 50 or so in under a half-hour. Don't waste your time trying to catch mice with a kitten, let the cat grow up. Varrock Armour 2 acquired, so at least that's out of the way.